The course is the second of a two-course series, the first is Qualitative Data Analysis I that I will teach on 1-5 July 2019. This five-day course offers advanced training in qualitative content analysis (Schreier, 2012), thematic analysis (Boyatzis, 1998), cross-case analysis (Miles and Huberman, 1994) and grounded theory (Strauss and Corbin, 1998) using NVivo 12. The course fills an existing gap in both the literature and in training in that it addresses the above four methods — from data sampling, coding and analysis right through to visualisation in a CAQDAS environment. The first four days of the course are dedicated, a day each, to the four methods, each studied and applied in NVivo 12 in terms of sampling requirements, coding procedures, pattern seeking and reporting conventions. On the last day of the course we look at the possibilities for integrating components of different methods in a single study, thus illustrating the promises, but also the potential pitfalls, of methods integration. The course concludes with a workshop on criteria for assessing qualitative analysis quality. 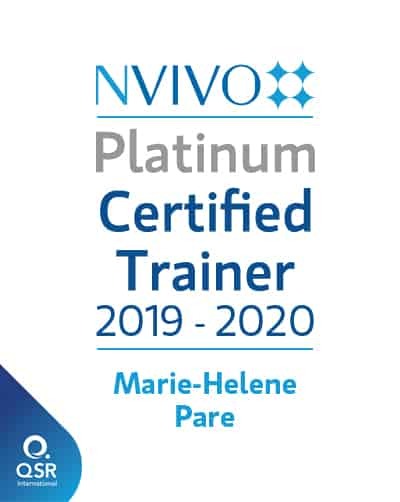 As this is an advanced course, participants will need to have a solid conceptual and practical grounding in qualitative analysis and be advanced NVivo users. This course requires advanced knowledge of qualitative research and NVivo. This course comes after the introductory course Qualitative Data Analysis I which I will teach on 1-5 July 2019. For further information, see the IPSA-NUS website.